Zombie Mel Blanc to Stutter from the Grave | Critical End! Looks like Warner Bros. plans to make some more of those CG shorts to show before their movies. While I take issue with the fact that they’re only playing in front of kids’ flicks instead of the more general films they played with in the Tunes’ heyday, I think this is pretty cool idea. 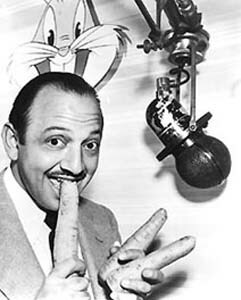 What’s doubly interesting, though, is that the shorts will take advantage of some old recordings of cartoon legend Mel Blanc to bring his voice back to some of the characters he originated. I’m on board, depending on how it’s handled. If we’re talking about a full-on Blanc performance cobbled together from songs and lines he recorded in the past, that’s great. But if it’s anything like that creepy hologram of Bob Hope from this year’s Oscars, where they used a sound-a-like to grab lines they didn’t have, I’m a lot less enthused. Either way though, the man is an often unsung entertainment giant, and it’ll be great to see his name on the big screen where it belongs. You too can now own a freaky looking Gizmo-ish plush thing! Tags: Bob Hope, looney tunes, Mel Blanc, Oscars, Warner Bros. This entry was posted on Monday, June 13th, 2011 at 10:20 amand is filed under . You can follow any responses to this entry through the RSS 2.0 feed. Both comments and pings are currently closed.